Poor adherence or compliance to treatment has major medical, psychological and economic consequences. 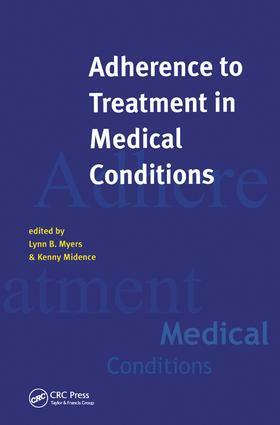 This monographs provides comprehensive coverage of issues and research in the area of adherence and treatment in medical conditions. It covers all aspects within this field and includes chapters on the role of doctor-patient communications; memory; adherence in specific groups, such as children and the elderly; adherence to different treatments, such as diet and exercise; and reviews of adherence in specific conditions, such as diabetes and asthma. "The editors and the various authors do an excellent job of organizing the vast and complicated adherence literature that now weighs down library shelves around the world. For researchers and students of health psychology who are new to the field of adherence, this book is a good starting place." Predicting treatment adherenece - an overview of theoretical models, Robert Horne and John Weinman; health promotion - empowering choice, Keith Jones; adherence in ethnic groups, Mary Sissons-Joshi; adherence to lipid-lowering dietary advice, Kathryn Nicholson Perry, Lorna Rapoport and Jane Wardle; adherence to physiotherapy, Emmy Sluijs; adherence in hypertension and coronary heart disease, Yori Gidron; adherence issues on methadone treatment for opiate dependence, James Elander.